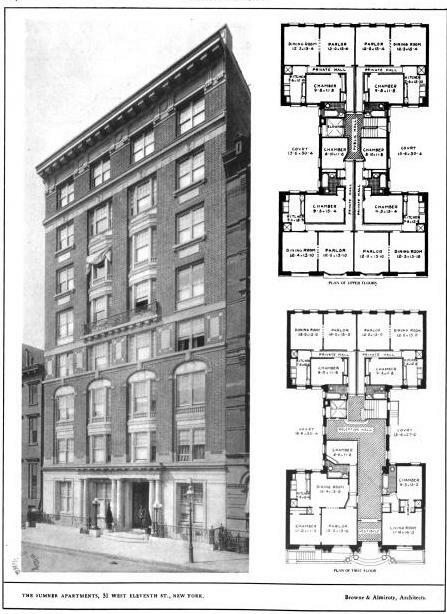 The Sumner Apartments designed by Browne & Almiroty c. 1910 at 31 West 11th Street in New York City. In 1915 Rita Jolivet's sister committed suicide in apartment 19 following the death of her sister's husband on the Lusitania. Click HERE to see the building on google street view. 31 West 11th Street, and have been doing a bit of research to see if there was ever a canopy over the entrance, and I found your site. I will spend many hours enjoying your posts. BTW- the building now consists of 2 apartments per floor and care was taken to restore the facade. It's a nice place to live.